Your Worst Tree is Our Specialty! That is a tagline one of our customers came up with for us many years ago. It does ring true in that we often win the jobs with the most dangerous and technical Portland tree removals, jobs that other companies don’t want to take on. These jobs are our lifeblood. Because of the high skill level of our arborists, we are able to do the worst jobs in less time than our competitors. All trees removed by Urban Forest Pro are removed by ISA-certified arborists in Portland according to ANSI safety standards. Most of the branches will be roped down and pieces coming off of the tree remain under our control at all times. We use approved rigging techniques to protect your property. All branches and debris are chipped and then recycled. The wood can be cut into 16″-18″ rounds left on site for your use or removed by us. If you want to know more, you can read more about the tree removal process here. The cost of tree removal varies widely based on several factors. 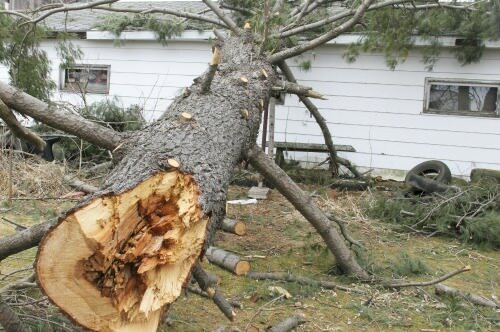 We wrote this blog post to help explain the average price of tree removal. We offer price matching with any other properly licensed tree removal Portland company so you won’t need to pay more. All you need to do is email us the other company’s estimate and we will match it. For example, if you have a tree next to your home and you have safety concerns for your home and your children at play, but you love the look of the tree and the shade it provides. You should rank those factors by importance: 1. Safety 2. Shade 3. Looks. You might even get more specific about what you like about the look of the tree or what your exact safety concerns are. If your property is a rental property you might have completely different goals such as reducing maintenance and potential liability. If you simply have a tree you don’t like, it is important to think about why you dislike the tree. For example, we had a customer who wanted a tree removed because it dropped too much sap in the summer making her deck unusable. It was going to cost her about $3,000 to remove the tree. It turned out all she needed really needed was a $200-$400 treatment in the spring to prevent the aphids that were the actual sap producers. She is now enjoying her deck and her tree. How do I know when a tree should be removed? It is difficult for an untrained eye to recognize when a tree must go. We suggest you call for one of our free estimates. But also keep in mind tree service estimators are not always independent and might push to remove because they want the increased revenue. It is best to always get the opinion of an independent consulting arborist if you have any doubt about whether or not the tree could survive. Of course, all of our estimators only give their independent opinion about the true condition of the trees they inspect. Trees are removed for a variety of reasons including but not limited to: failing health, poor location, property development, too much maintenance required, improper pruning in the past, pests, threatening assets below, and much much more. What should I expect when having my tree removed by Urban Forest Pro? The arborists and crew will come within an hour of their scheduled arrival. They will use ISA certified techniques to safely remove your tree. We can leave the wood in 16-18″ rounds for firewood or remove it. All the branches and other debris from the removal of the tree will be chipped and taken away. The crew will return at another time to grind the stump if that is being done. Your stump will be ground 12″ down and the grindings will be left. Any damages need to be reported to the main office ASAP and we will respond with scheduled repairs within 2 days of your call. Do I need a permit to remove my tree? Probably yes, most cities in our area have tree removal ordinances and many of these ordinances include trees anywhere on your property. You also, as part of the process, might be required to replant. If you have a commercial property the answer is a definite YES. We can help with permit acquisition and help you navigate your cites ordinances. Removing a tree without a permit could result in thousands of dollars of fines to the homeowner and/or the tree service. What are my options for replanting my tree? If you are planting a street tree, your city will have to approve the type and size of the tree planted, and you will need to get a permit. If you are looking for a tree for your yard, your options are endless. Take a look around you and take note of what you like and dislike about different trees. Armed with that information our arborists can suggest a tree that meets your needs and works in your intended location. I hate my neighbor’s tree what can I do? Not much. Your best bet is to work with your neighbor to come to a compromise. You could offer to pay half of the costs or get the opinion of an arborist in regard what should be done with the tree. What you should not do is go ahead and prune or remove the tree even if it is on your property. Legal or not (we are not lawyers) this could lead to an expensive legal battle. We can often help neighbors come to a compromise, but as a policy we do not do work where neighbors are in disagreement. My neighbor’s tree is threatening my property what can I do? If your neighbor’s tree is truly a threat we still recommend you try and work it out with them. There are in this case, a few things you can do to force their hand. One is bring the tree to the attention of the city by submitting an arborist report on the tree. In certain cases they can order it removed. You can also report the tree to their home owners’ insurance company or HOA and that may force them to have it taken care of. But we cannot stress enough, how much better things work out in the end, when you can come to an agreement with your neighbor. Be clear with the arborist about your goals and ask the arborist in order to achieve these goals what your options are. Under your particular circumstances, you may have the option to prune the tree, treat it, fertilize it, or remove it. It just depends on your specific circumstances. There are also many cases where customers call us about pruning a tree and are not even considering removal and we have to give them the unfortunate news that in order to achieve their goals their tree must come out. If the customer’s goal is to eliminate branches overhanging the house, reduce the height of the tree, or stop a tree from uplifting concrete there are many cases where the only true answer to those problems is removal. Why we recommend the removal of a tree is often difficult for customers to understand. We don’t necessarily like to cut down healthy trees, but trees are renewable and they can be replanted and most cases it is better to remove a tree and start over with the right tree in the right location where it will grow and prosper over the long run then to provide a band-aid solution that only further advances an unsustainable situation. In addition is most cases delaying the inevitable increases the cost of the removal. There are of course exceptions such as very old very significant trees where a lot is lost in their removal and so monitoring them and easing them into the grave becomes preferable. The ultimate decision to remove a tree may not be up to you entirely. In many cases the final word is provided by the city through a Portland tree removal permit process. This can even be the case if the tree is on your private property. Your arborist can be helpful here also either submitting a permit on your behalf or pointing you in the right direction. Many cities have begun to crack down on unpermitted tree removal and the fines in most cases are in the thousands of dollars per tree so it is important to make sure you have your paperwork in order before the crew begins work. It is my experience that once customers go through this process they can feel good about the decision they are making. I think this is because they are clear on the fact that what they are doing is for the best and that although there is a loss in the short run, in the long run, they are doing what is best of them, the tree, the property, and the community. Customers can also be comforted by the fact that every part of the tree in reused. The wood is either milled into lumber or used as firewood and the chips are used as mulch to fight invasive plants and rebuild native habitats. Most of these materials are donated by us to nonprofits and municipalities. We understand the temptation to try and remove a tree yourself. And most of us have seen viral videos of hapless homeowners cutting down trees, only to see them fall in a direction they did not intend, most often towards their homes. Sometimes it’s carelessness, other times it’s well-intentioned people making costly mistakes. While we poke fun at these people, the results are no laughing matter. Tree cutting is dangerous, even for those who make a living doing so. Professionals are injured every day. 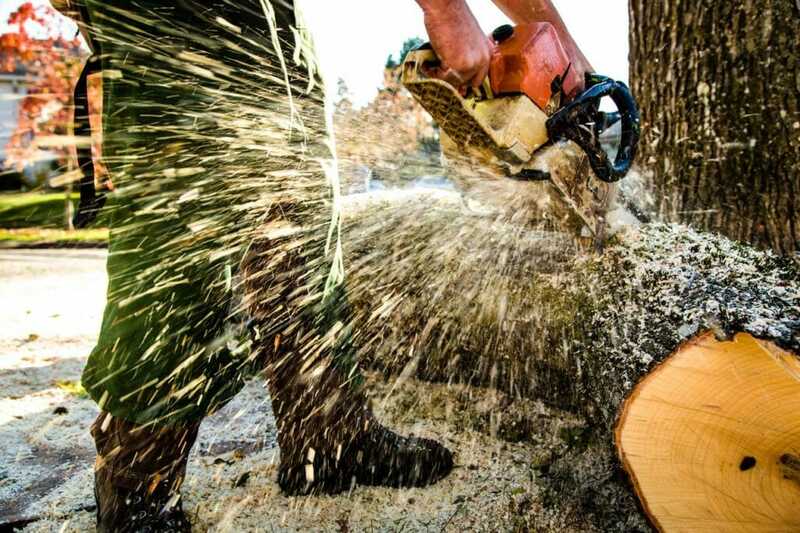 According to the Tree Care Industry Association, there were 84 fatalities in 2012. Of the fatalities reported to the Census of Fatal Occupational Injuries from 1992 to 2007, the average annual rate was 80 deaths. Another reason it’s wise to defer to a professional arborist is avoiding the legal liability if an accident occurs. If you damage a neighbor’s property, or worse, injure someone, you are on the hook. A licensed and insured arborist takes this potential burden away from you. In addition to the skills unique to trained tree care professionals, there is specialized equipment that homeowners are not likely to have. Even if you had the skills to do the job, it would not make financial sense to buy or rent this equipment for one-time use. Risks are not always easy to identify, so familiarity and expertise almost always trump well-intentioned do-it-yourself ambition. If you have a tree you need removed from your property, give us a call today. 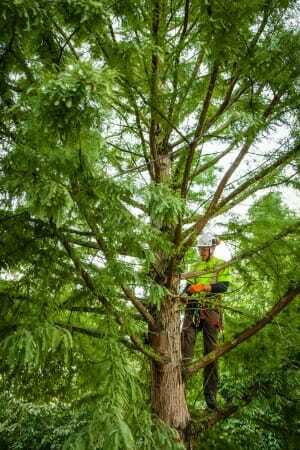 Urban Forest Professionals in Portland have completed jobs from removing the smallest residential trees to removing hundreds of hazardous commercial trees. 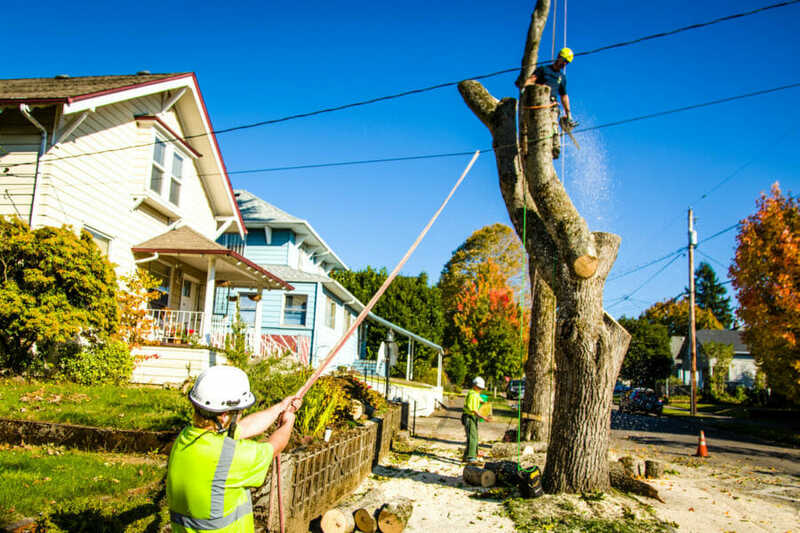 As a full-service tree removal Portland company, we can remove trees of all sizes and in every situation. Call 503-487-0683 today for a free tree removal estimate.